Have you ever wondered what those rust-brown flowers are that cover some of our dry slopes and meadows? It’s California buckwheat. 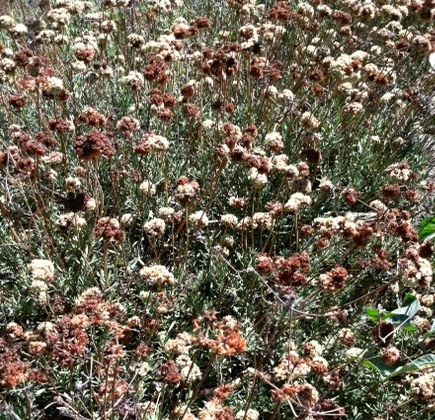 California buckwheat or wild buckwheat (Eriogonum fasciculatim) is found on dry slopes and meadows below 7,000 feet. It is often the primary plant you will see. The leaves are needle-like and tough—sort of like a gray version of rosemary leaves. Flowers begin as white and pink puffs that turn rust-brown over time. They are a primary food and habitat for bees and other pollinators. Native peoples, including the Kumeyaay and Chumash used the Buckwheat plant for food and medicine. Seeds were harvested and could be eaten raw. They were also ground into a flour to make a bread-like cake and cooked into soups with acorns and other plants. Flowers and seeds can be harvested once the flower heads are dry. Leaves were brewed into a tea to treat all manner of illnesses, including colds, headaches and stomach pain. A tea from leaves and stems treated urinary tract infections, while a tea from the flowers was used as a laxative. The root was used to make poultices to place on wounds. All parts of the plant proved useful. This is one of those plants that can easily be overlooked because it’s all around us and it appears scrubby. Take some time to observe this plant in detail. It’s a testament to strength and utility. Like so many of our native plants, all parts of it are useful. And also, like so many of our natives, it is having a hard time these days. In parts of the state it has declined due to repeated fires in an area. Look for the brownish-red flowers now through the autumn, and appreciate the gifts we have around us!